The aim of this study is to verify the prevalence of risk factors for transient osteoporosis (TO) in a cohort of patients selected by strict diagnostic criteria. Retrospective observational cohort study on outpatients’ data. 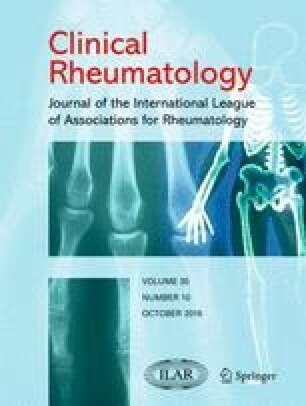 Inclusion criteria were: (1) acute onset of pain at a lower limb joint exacerbated by weight bearing; (2) no history of trauma, tumors, rheumatic diseases, or infection; (3) presence bone marrow edema on MRI in a weight bearing joint without signs of intraarticular lesions; (4) no hyperesthesia and/or allodynia and/or sweeting changes. The following risk factors were search for in all patients: (1) previous episode of TO; (2) disorders of bone metabolism; (3) cigarette smoke; (4) sudden lower limb overuse; (5) presence of osteoporosis/osteopenia. Twenty-three patients (8 females, 15 males, mean age 48.4 years) fulfilled the inclusion criteria. An average of 1.96 risk factors for TO was present in the cohort. The most frequent risk factor was overuse (in 15 patients, 65.2 %) and the second risk factor was bone metabolism disorders (in 10 patients, 43.5 %). Seven patients (30.4 %) were heavy smokers (more than 20 cigarettes per day) and seven patients showed a previous episode of TO. Six patients (26.1 % of the overall cohort but 60 % of those investigated with DEXA) resulted osteoporotic or osteopenic. Our results suggest there are risk factors that must be investigated in these patients. The presence of these risk factors might support the thesis that their disorder is tied to a decoupling between microdamage accumulation and self-reparative ability of bone tissue. The identification of risk factors with a precise diagnostic pathway can accelerate the diagnostic process and reduce recurrences. This is a retrospective observational cohort study of outpatients clinical records conducted under the principles of Helsinki’s Declaration with the approval of our hospital’s ethics committee.